How much can we lower your manufacturing costs? We believe that most smaller U.S. companies can benefit by Asian outsourcing. But most of them don't have the time or the budget to send valuable staff resources to the Far East in search of reliable sources that can meet their pricing, quality and delivery needs. Silk Road Asian Sourcing can provide all of these services, efficiently and cost effectively! 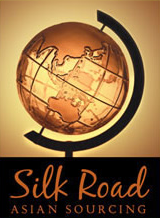 Silk Road can be your very own sourcing agent in Asia. Whatever the product or manufacturing process you need, we can find it! We’ll use the contacts that we have carefully nurtured over many years, and we'll match you up with the best, most appropriate partners for your project. We typically help our clients increase their margins by at least 10 percent, or even more depending on the product. The possibilities are great for dramatic improvements in your efficiency and significantly reduced overhead. Is it time to streamline your business and improve your competitiveness? Silk Road Asian Sourcing will save you money! How do we help you with your costs? There are thousands of factories throughout Asia, any number of which may be ideal for your needs. But how do you find the perfect partner? Silk Road does it for you. We provide you with competitive pricing from at least three sources to assure you that we’ve found the best price in the marketplace. If there is a great disparity in the prices, we go back to the well for more, until we’re sure we have a lock on the price point. Silk Road Asian Sourcing not only delivers high quality products, but also it increases your business potential by selecting the partner that best meets your product requirements. This ensures you receive the best pricing and superior service throughout the project. How do we help with the production process? In today's global marketplace, small and medium-sized businesses have difficulty competing with the big companies who drastically cut their costs by outsourcing their production to Asia and then flooding the market with inexpensive, foreign-made products. At the same time, the cost of doing business in the U.S. continues to increase, making it even more difficult for the smaller companies to compete. Therefore, if you want to stay competitive—and you do!--you'll need to find an easy and cost effective way to get your own foreign-made products. That's what Silk Road Asian Sourcing does for you—we locate sources in Asia that can quickly and cost-effectively produce your goods. Today, manufacturing in North America and even Mexico simply does not provide you with the cost savings that will allow you to be competitive in the marketplace. Asia, and particularly China, has become the world's manufacturer. Low labor costs, excellent infrastructure, and a motivated work force have all contributed to this emergence. Asian workmanship is now widely considered to be among the best in the world. You know your business better than anyone. But we know Asian markets, laws and customs. The process, and the culture, can be complex. Silk Road can help you work through the details, from finding a factory whose quality can stand up to your standards, to price negotiation, Asian-style. Do you want to find a factory in Asia, but you’re not sure where to begin? How will we find the factory? Silk Road Asian Sourcing has spent years compiling an extraordinarily complete factory source list. We have visited showrooms and factory floors at hundreds of factories throughout Asia. We have met and negotiated with thousands of factory representatives. It is that considerable experience and those fine resources that we will use to help you find a factory partner perfectly suited to your company. We specialize in procurement of items in wood and MDF, glass and acrylic, plastic, polyresin, porcelain, brass, pewter, iron, textile items, enamel, jewelry, mixed media, garden, toys, paper goods, Christmas… yes, we specialize in just about everything. How can we help you with the tradeshows? You probably are aware there are gift, handicraft, premium, jewelry and commodities fairs in practically every country throughout Asia. You are likely thinking, "Do I need to attend the fairs? Which ones? What will we gain? How long will it take? What is the return on my investment?" Representatives from Silk Road Asian Sourcing attend the fairs and make factory visits three to four times a year. Instead of sending your own people at great expense to you, Silk Road can shop for you—at a fraction of the cost of sending your own people, we will source new product ideas and new factories on your behalf, and present to you a comprehensive report of all that we saw. You will have saved on your budget line, but still kept up with the trends in the marketplace. What a great idea! What a bargain!